The pleasant whether with soothing cold in the evening at the verdant premises of the magnificent Rajarani temple bedecked with colourful lights and appliqué works synchronized with enchanting and sonorous music by great stalwarts attributed to a large gathering on the second day of Rajarani Music Festival. 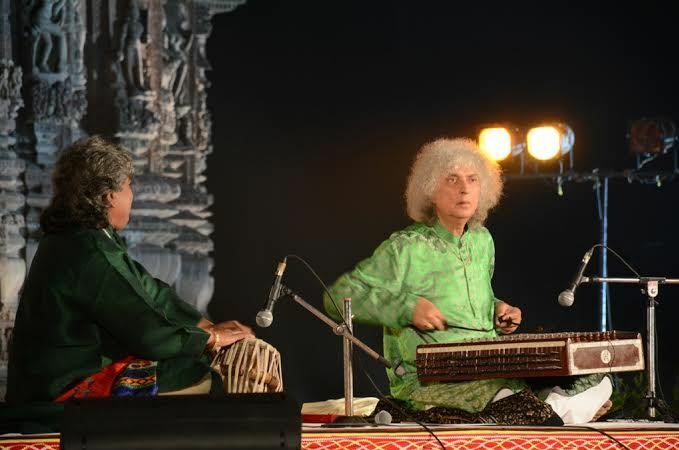 The evening’s first programme was Santoor play by Pandit Shiv Kumar Sharma. He is credited for making santoor, a popular classical instrument so much so that santoor became his identity. With his sheer brilliance and conviction he has bridged the gap between folk and classical music. In his play the weaving of different patterns in different tempos, rhythms and gaits in the given tala, developed variations creating aesthetics in melodic theme developed from simplicity to complexity increasing embellishment and dynamics. The decorative elements are very judiciously applied so as to enhance the beauty of the compositions. He was accompanied on Tanpura Takahero Tadai and on Tabla Shri Ram Kumar Sharma. Evening second presentation was Carnatic Vocal by T. M. Krishna. His humanitarian values heighten his music as well as his writings which cover social and musical issues. His first item was Rag Nataee and Tal Talam followed by five composition of Rag. His rendition in high octave enamoured the audiences who were deeply engrossed by the presentation of this colossus personality in Indian classical music. The dignitaries who graced the occasion were Dr. Priyambada Mohanty Hejmadi, Eminent Odissi Dancer; Shri G.V.P Sharma, Principal Secretary, General Administration and Higher Education and Shri N. B. Jawale, Director, Tourism. The programme was compered by Smt. Sangita Gosain and Dr. Arshiya Sethi.